I am the founder and owner of Dundas Euclid Animal Hospital. I came to Canada as a young child with my family from Chile. Since I was a small boy I had a fascination with animals. I was always trying to convince my parents to accept a new pet that I had taken in or somebody was trying to give away. My collection of pets ranged from a chicken to a budgie, to a turtle, and of course a cat and a dog. When I finally went to university I decided to combine my love of animals with my interest in medicine. Thus, I studied Veterinary Medicine at the University of Guelph and I graduated in 1993. For the first few years of my career I worked in a mixed practice in central Ontario. My patients included cows, horses, pigs, yaks as well as dogs cats and exotic pets. After this I worked at several animal clinics in the Greater Toronto area. My special interests include emergency medicine, internal medicine and soft tissue surgery. On the personal side, I am married to Brigida Fortuna and we have four wonderful sons. We enjoy camping, bike riding, movies and downtown living. For as long as I can remember I have wanted to be a veterinarian. It started as a little girl with an immediate love for animals and progressed to a curiosity for how the body works. Combining this love for animals with my interest in science made veterinary medicine an obvious path. I completed an undergraduate degree in Animal Biology at the University of Guelph in 2009 and a Doctorate of Veterinary Medicine at the Ontario Veterinary College in 2013. I practiced in the Kawartha Lakes for two and a half years. I gained a lot of experience working in rural Ontario, everything from middle of the night c-sections to pulling endless porcupine quills from dogs. Although living in cottage country was beautiful, I yearned for the excitement of the city! A few months before moving, I tragically lost my two-year-old cat Leo to an underlying heart condition. Leo was a special cat and will forever hold a place in my heart. However it didn’t take long for a naughty kitten to squeeze his way in. I am now the proud mom to Carter who is as mischievous as he is cute. When I am not working you can find me exploring this great city and enjoying all of its culinary delights. Besides veterinary medicine, my passion is without a doubt, food! The next time you are in, strike up a conversation about food and watch my face light up. Hi! My name is Lucia Delgado de la Flor. I grew up in Peru’s capitol, Lima; a beautiful city by the sea filled with good people and even better food. I knew I wanted to be vet since I was little girl and spent most of my childhood chasing animals on my grandfather’s farm or trying to get bandages to stick on the family dog. I went to one of the top schools in Lima, where I graduated third off my class on 2010 with an interest in small animal medicine and wildlife. On 2012 I got married and soon after that my husband Alejandro and I came to Canada to stay. I took me almost 2 years and even more sweat and tears, but by the end of 2014 I got license to practice veterinary medicine here in Canada. I have been happily working here at Dundas Euclid Animal Hospital since this last February, and I really enjoy the chance to look after all your furry little family members. On a personal note, me and husband own a beautiful grey and white cat named Abbey Road (or maybe I should said she owns us) who loves to scare me to death by hiding on unsuspecting places and play fetch at three in the morning. The three of us have just move to Toronto recently and we are really excited about exploring what the city has to offer. I was born in Serbia in 1965. I grew up in the country, learning how nature is important, always surrounded with a lot of pets (from frogs to pigs, and of course more commonly, cats and dogs). I graduated from Vet University in Belgrade and was working there as veterinarian for several years. In 2002 I came to Canada, and five months after I became a technician at Dundas Euclid Animal Hospital. I had and still have the privilege to help a lot of animals, in the best way I know. I am also a proud owner of two adorable cats: Squirrel and MacMilena, both adopted from Annex Cat Rescue. They like to join me in resting moments in front of my aquarium, and tolerate pretty well most of my plants which surround them. I like biking too, and find that as well as being good exercise it is the best way to travel through the city. Hello, I’m Wendy! I grew up in the small city of Barrie, about an hour drive north of the city. It was always my dream to work with animals and I was determined to make that happen. 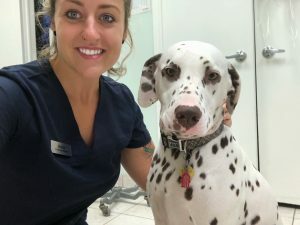 While completing my degree in Animal Biology at the University of Guelph, I began to research the roles that a veterinary technician plays in a clinic – nurse, radiographer, laboratory technician, anaesthesiologist, etc. It became very clear that this was the career path for me. After receiving my BSc, I enrolled in the Veterinary Technology program at Georgian College where I graduated with honours in 2011. I completed my credentials to become registered soon after and have been a member with the Ontario Association of Veterinary Technicians (OAVT) ever since. After working at a variety of different clinics throughout Ontario over the years, I am thrilled to find a new home base at Dundas Euclid Animal Hospital! Outside of work, I enjoy spending quality time with my partner, Tom, my fluffy grey and white cat, Dallas, and our lovable Flat Coated Retriever, Morty. I also have quite the travel bug and have backpacked through several countries in South America, Oceania, Asia, and Europe. If you are ever looking for travel tips or advice, please do not hesitate to ask for me! I have spent most of my life living in Etobicoke but my first childhood memories were made in my home in Parkdale. Growing up as a kid, I have ALWAYS loved animals and have owned many different pets. My current fur babies are two dogs named Snowball & Misty and two rats named Bacon & Eggy. In 2016, I started the Veterinary Technician program at Seneca College and began the journey to my future career. It was not easy to get into this competitive program, but I truly knew that helping animals was what I was destined to do, so I never gave up. Before coming to DEAH, I was a barista at Aroma Liberty Village for 2 years. It was difficult leaving my coworkers, but luckily DEAH is just minutes away from here so I always visit them whenever I can. I also had a summer job at a Wildlife Rehabilitation Center where I helped save orphaned, sick or injured animals and I loved it so much that I’m STILL volunteering there every Sunday! In February 2018, I became a part of the DEAH team! Working with the amazing veterinarians and technicians here has taught me so much already and has made me a lot more confident in myself as a technician. What I like the most about DEAH is that everyone here has been incredibly welcoming and kind towards me but most importantly, I’ve gained the approval of my new coworkers’ dogs and our clinic cat Fred as well! I grew up in Brantford, a small city about an hour and a half south-west of TO. I can’t remember a time I didn’t have pets, yes that’s plural… I can never have just one. My first ever pets were 2 rats named Brownie and Cottonball. Over the years I have had just about every pet you can think of: rat, hamster, guinea pig, cat, snake, turtle, fish, butterfly(yes, a pet butterfly), chinchilla, degu, frog & dog. Currently in my home I have 3 cats, a dog, and a snake. It can get pretty crazy- but I wouldn’t have it any other way! Throughout high school I spent my summers volunteering at a horseback riding camp; working the stables, caring for the horses, and teaching children the basics of horseback riding. I also spent my senior years of high school volunteering at a veterinary clinic helping out on weekends. Before coming to DEAH, I spent many years in the customer service/hospitality industry in various roles. I also went to Seneca college where I graduated in 2017 with a marketing diploma. Fast forward to today! I just recently started at DEAH as their ACA- and in my short time of being here, I already feel super welcomed into the DEAH family, and have learned so much. Being an ACA I am able to take my love and passion for animals, and use those skills combined with my customer service when dealing with all the fur moms and dads; which makes ACA and myself the perfect match! Catch me out with my camera on weekends taking photos of cats and dogs. Photography is another passion of mine that I have been able to combine with my love of animals by doing pet photography. I also work with a couple of cat/dog rescues in the GTA and take photos of their foster animals up for adoption. Don’t be surprised if I ask to take a pic of your fur baby when you visit the clinic… I can’t help myself when I have a cute animal photo-opp! I have been a customer service representative at Dundas Euclid Animal Hospital since June 2015. I am a slef-described crazy dog lady who, like most children, wanted to be a vet growing up. I grew up in Waterloo, Ontario with two shih-poos, who sparked my love for dogs. Growing up, I was always writing stories (albeit, usually about puppies and or horses), and that passion for writing pushed me to purse a bachelor’s degree in journalism at Ryserson University, which I obtained in 2012. For the next three years, I worked as the associate editor at a news website for young children, When the website went out of business, I decided to use the opportunity to try and pursue a career in the veterinary field. Who wouldn’t want to work with dogs and cats all day? I started in the industry by volunteering at our sister clinic Sherbourne Animal Hospital in February 2015. Now I also work att one of our other sister clinics, Front Street Animal Hospital. 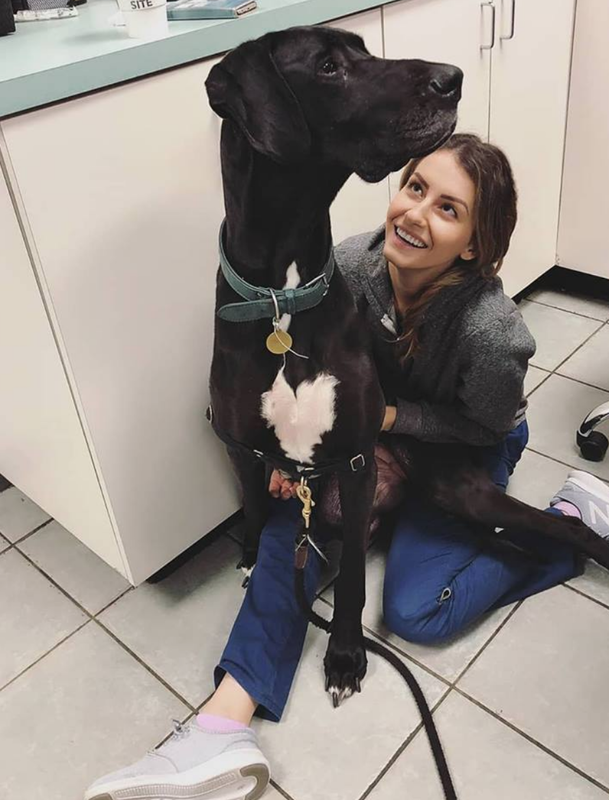 Working at three different clinics has given me a lot of different learning experiences and allowed me to meet so many unique dogs and cats. I love being able to greet client and nothing makes me happier than being able to give a cookie to any dog that walks through our door. When I’m not at work, I can be found snuggling with my rescue dog Bo, or being fully submerged in my latest DIY project. I love crafting, interior design, horseback riding, spending time with friends, and exploring the city. Hello, I’m Jen! I have always had a passion for working with animals. 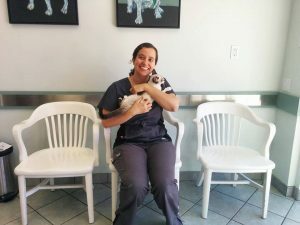 After volunteering at an animal hospital when I was just 18 years old, I knew that I had found my calling. 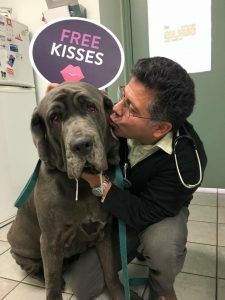 I have since had the chance to work at a few different veterinary clinics around Toronto and have been working for Dr Barrientos since 2012. I can’t imagine myself doing anything else besides having the pleasure working with animals! 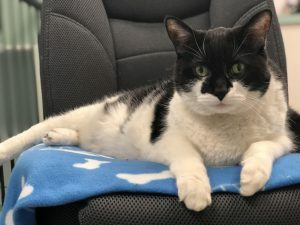 I also run my own pet sitting company called “Heartbeat at my Feet”, which provides live in pet sitting and home visits for cats, dogs, and exotic animals. Feel free to ask me for more information if you’re in need for your own furry family members! I have two rescue cats (with ridiculous names) “Robot Tiger Escobar” and “Slash Mittens Perez” (aka Mr. Slashy Pants). Fun fact; Slash is polydactyl and has 23 toes! Hiya! My name is Kira, and I’m a receptionist here at Dundas Euclid. I started off by volunteering and now I’ve been working part-time for about 5 years! I am currently going to the University of Toronto part-time as well, working on a degree in Biological Anthropology and Archaeology. I have an enormous love for animals and have had a wild mix of pets in the past, from cats to ferrets to a snake. I recently adopted a cat that was brought to the clinic from the Annex Cat Rescue, and fell absolutely in love with the little guy who now goes by Arthur! I’m always more than happy to help answer your questions or chat about your fluffy friends. I have been grooming at Dundas Euclid Animal Hospital/Fluffy Tails since 2014. I have been grooming professionally for more than 10 years and am a second generation dog groomer. My mother has been a dog groomer and instructor for over 30 years in the Thornhill/Richmond Hill area, and she has taught me everything I need to know to care for your pet. In elementary school I began helping my mother in her salon, starting off with washing and drying dogs, and gradually learning cuts and styles for different breeds as I continued on to high school and university. Not knowing what I wanted to do career-wise, I studied at York University and graduated with a bachelor’s degree in Humanities. Since working at DEAH, I’ve learned so much! My passion for dog grooming has only become stronger, and I look forward to going to work everyday. I have the pleasure of getting to know so many lovely clients and their pets. As a groomer, I get to see every inch of your pet from their head to their toes. I see every scar, every bruise, and sometimes even pests like fleas and ticks. If I see anything I will always notify a doctor and veterinary technician to ensure your pet is safe and healthy. I care about every pet who’s been on my grooming table, and I will always treat them like they’re my own. I value humanity over vanity for any groom that I do. If I see that your pet is uncomfortable or in pain during any grooming process I will look for alternate ways to help them feel relaxed and have a positive spaw experience. Aside from dog grooming, I am a professional Japanese floor harpist. I also love arts and crafts, so I’m always making something afterwork. I have some interest in fashion as well, and would some day, like to combine it with my passion of dog grooming.I currently have no pets of my own, but will be looking to adopt one (or two) in the near future. Hi, my name is Fred! I was surrendered to Dundas Euclid Animal Hospital awhile ago and I must say that I have found a forever home with these caring staff members 🙂 Since I have been here I have had tons of belly rubs and relaxing brushing sessions! I can’t complain one bit. I am a bit shy so I don’t wonder around the clinic too much. I tend to spend most of my time lounging by Melissa’s desk or on Melissa’s desk. I love my new home and I wouldn’t have it any other way!! Interests: Begging for food and running away from dogs!